This beautiful window was executed by William Warrington of London in 1845 (in Vicar Girdlestone's time). It is 11ft wide by 14ft 6ins high and contains 14 figures in two rows of seven. It is a seven light pointed window with Perpendicular tracery in the head, portraying Christ and the Apostles, including St.Paul. 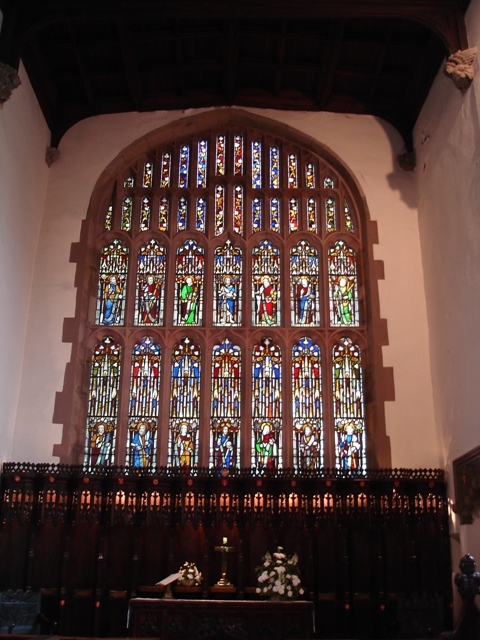 The window, is reputed to be one of the best imitations of ancient stained glass in the country. Rev.E.Girdlestone appealed for stained-glass to be put in the east window as "an ornament to our venerable and ancient church and as a personal kindness towards myself." William Hulton, Esq., in an eloquent speech denounced this as a return to the idolatrous days before the "glorious Reformation." He said: "In the house of God, everything ought - according to the Apostle's injunction - to be done decently and in order, but it does not appear to me that stained glass at more than £260 is requisite for these qualifications of a Protestant place of worship in a country village." Fortunately, his pleading did not prevail, and in 1845 stained-glass was put in. Jesus is portrayed in the centre of the lower row with 3 Apostles on either side; 6 other Apostles are in the upper row, together with St. John, the Baptist. "The East window (of Deane Church), which is of great size, has been embellished with figures of our twelve apostles, in richly stained glass executed by William Warrington of London, and this imitation of ancient stained glass is said to be one of the best yet produced in the country". "The eastern, or altar end, window is enclosed by a horseshoe arch of large span. The stained glass is splendid, being filled in compartments with 14 evangelical figures, in flowing robes, exquisitely coloured; and niche-cuspated, fret and foliated work adorn the whole. The tracery consists of seven lights each in the three transoms, all grouped and mullioned." St. Matthew, (LEVI, the tax gatherer) holding a sword. St. Philip, holding a cross. St. Peter, with a large key, as being the leader of the early Church. St. John, The Baptist, holding a lamb. St. Paul, holding what may be a scroll wrapped around a staff, with a decorated top. St. James (The Greater) has a scroll under his left arm and holds a staff ornamented with scallop shell. The latter refers to pilgrimage, and St. James may have been the first disciple to go on a missionary journey. James and John were son s of Zebedee and, because they were impetuous, Jesus called them "Boanerges" or "sons of thunder". St. Andrew holds two loaves. At the feeding of the Five Thousand, it was he who said "There is a boy here with five barley loaves and two fish". Tradition says that Andrew was crucified on a transverse cross - hence the St. Andrew's flag. St. Simon the Zealot, a member of a strict Jewish sect - holds what might be the artist's impression of a falchion or type of broadsword (like a saw). Tradition says that he was hewed to death by heathen priests. Simon was a companion of St. Jude (or Thaddeus) on many missionary journeys. St. Bartholomew (Nathaniel, according to St. John's Gospel) has a scroll under his right arm and there is a flaying knife depicted in his right hand. It is said that he was flayed before being beheaded. St. John (the 'Beloved Disciple') has a golden chalice in his right hand. There is a legend that he was offered a golden chalice containing poisoned wine. He was the writer of the fourth GOSPEL; three Epistles and the last book in the BIBLE, "THE REVELATION TO JOHN". Our Lord Jesus giving a blessing with his right hand, and holding a symbolic world in his left. St. James (The Less), son of Alpheus is holding a fuller's club in his right hand, and a scroll under his left arm. St. Thomas called Didymus (the Twin); also called the Doubter has a scroll under his right arm and holds a spear in his left hand. The spear refers to his martyrdom, and tradition says it happened in India. Even King Alfred of Wessex, 800 years later believed that Thomas had been a missionary in India and sent alms to India "to St. Thomas and St. Bartholomew" as well as to Rome. St. Thomas is a patron saint of builders and sometimes has a carpenter's square attached to the spear. St. Matthias is holding a sword in his left hand. He was chosen by lot to become an Apostle in place of Judas Iscariot. His missionary work was mainly in Judaea, where he was stoned and beheaded. It appears that Mr. Warrington, the artist, has left out St. Jude (the companion of St. Simon on many missionary journeys) and put in St. Paul to make up twelve apostles, and with ST. JOHN, the Baptist, and our LORD Jesus, the 14 figures in the window. To appreciate the full beauty of the window it should be viewed when the morning sun is shining. Then the gold of the chalice, the greens, blues and reds of the robes, and the many colours of the niches and small lancets rejoice the heart. Over the years there has been adverse comments about the Reredos (erected in 1886, in memory of Bishop Fraser, Lord Bishop of Manchester 1870-1885), obscuring the feet of the figures in the lower row. To determine if something could be done about this, Canon K.M.Bishop approached Manchester University in 1959. The conclusion was not to alter it.